The much publicized and long-awaited Maruti Jimny is finally ready to be launched into the Indian car market making it Maruti’s latest foray into the entry-level SUV segment following the debacle of the Gypsy and coldly received Vitara models. In order for Maruti to grab a decent share of the now competitive SUV segment sales of the Jimny are of the utmost importance. Maruti is hoping to position the Jimny between the Gypsy and the Vitara and it has a fight on its hands if it has to compete with the current market leader in entry level SUV’s – Mahindra. Maruti is expected to launch the Jimny later this year to Indian audiences and the vehicle will be available with a 1.5 multi-jet diesel engine. Surprisingly the Maruti Jimny was first unveiled at the 2004 Auto Expo and has been eagerly awaited since then because of its strong styling and aggressive looks. The short, boxy vehicle is zippy and is equally comfortable whizzing past traffic on urban streets or tearing up the dirt while off-roading. The Maruti Jimny looks to be a very capable vehicle and is equipped with a 1.5 liter, direct injection, 4 cylinder common rail engine that puts out 85 horsepower and max torque of 200 Nm. The 1.5 liter engine is mated to a 5-speed manual transmission that works smoothly in unison with the engine without compromising on power. According to sources at Maruti the Jimny should be fitted with front ventilated disc brakes and drum type trailing and leading rear brakes but we’ll have to wait and see about that. Suspension in the new Jimny will also provide maximum comfort over rough roads and potholes and will be 3 link stiff axle with spring coils at either end. Maruti has designed the Jimny in such a way so as to keep weight down to ensure the short wheel base is hard to and small stature of the vehicle does not affect performance or fuel efficiency. Presently it is hard to say what fuel economy figures will be, but guestimates suggest that it could be around 14 kmpl in the city and 19 kmpl on the highway. In an case mileage will eventually depend on its overall weight. Internationally the Jimny is sold by Suzuki in 2 variants, the Jimny JLX MPi and the Jimny JLX Ddi. Exact specifications of the Jimny being released in India are not known at the moment as no official declaration has been made regarding models to be released. The Jimny is a very capable vehicle whether on the road or off it and comes with the usual array of safety features as well. It has a hydraulic steering wheel, fog lights, dual front passenger airbags, anti-lock braking system (ABS) and side impact door beams all as standard. The 2011 Maruti Jimny is a swift, nippy vehicle and because of its light weight performs better than most would expect. It gets from 0-100 kph in about 13.3 seconds and has a of speed of around 160 kph. Ground clearance in the Jimny is also good and come in at 190mm which is very good for off-road drives. The handling of the Maruti is stable with the hydraulic steering wheel making it easier to control even off-road and the brakes do a stellar job of halting the car suddenly when required. The Maruti Jimny being an entry level SUV is on the smaller side when compared to traditional SUV’s. It has a short wheel base and light engine and comes as three-door SUV model. It has a very compact appearance but this does not detract from its robust muscular look. The front fascia of the Jimny is quite high off the ground and gives the car a taller appearance. The front is fitted with large square headlights, oversized bumper and broad air intakes at the bumper extremes below the headlights. The 2011 Maruti Jimny has straight lines and curves that give it a very boxy look but the lines flow from the bold front to the squared off rear smoothly. There is nothing grand about the design of the Jimny and it is styled with practicality and functionality in mind. The Jimny features same body colored retractable side view mirrors without incorporated turn indicators as these are placed above the front wheel wells. Power windows are available with the Jimny and the rear lift back has a fixed glass pane. The rear of the Jimny is also styled practically with the tail lights being positioned towards the center of the lift back to ensure maximum vision for other drivers. The tail lights are wide and vertically positioned and incorporate both brake as well as reverse lights. There are additional lights placed on the rear bumper and encompass the rear turn indicators. The rear hatch also has the spare tire fitted on it which further accentuates the typical SUV look while making it easier to access the tire quickly. The Maruti Jimny will come with 15 inch wheels and enough rubber to provide good grip in any weather on any surface. The interior of the Maruti continues with the styling concept from the outside – simple, practical and functional. The front cockpit is dressed with the usual arrangement of buttons and knobs that are not intrusive and provide perfect comfort for the passengers. The dash contains the audio, climate and A/C cluster, while the three-spoke steering wheel hydraulically powered to ensure easy maneuverability. The speedometer and tachometer are chrome embellished and give a better look to the instrument panel. The round dials of the instrument panel indicate usual information like fuel, high beam, etc. The drivers’ seat can be manually adjusted and is very comfortable while providing adequate support. The rear individual seats are also comfortable and can easily accommodate two passengers with enough head room and leg room. Entry to the rear seats is through the two front doors but they open pretty wide making it easier for the rear passengers to step in or out of the cabin. The front seats also slide ahead to ensure that rear passengers have an easier time of entering or exiting the vehicle. The interiors of the Jimny are designed to not only comfortably fir in passenger but also their luggage and for this reason the Jimny comes with rear foldable seats. The Maruti Jimny is a small but muscular vehicle that should be quite a hit with buyers of entry level SUV’s. The Jimny has been around internationally for many decades now and Maruti in collaboration with Suzuki has incorporated many of these features in the one that will be available in India. The Maruti Jimny should be available in India for about 7 lakhs and is a very affordable entry-level SUV containing all the necessary features that are likely to attract a number of buyers. Depending on exact specifications and mileage rating the Jimny has the potential to capture a large share of the entry-level SUV segment and give Mahindra a run for its money. The engine in the Jimny has Electronic multi-point fuel injection as well as an electronically controlled Exhaust Gas Recirculation to ensure high performance and precision. The is also a function of an Air Locking Hub which allows you to switch between four-wheel-drive and two-wheel-drive when driving on different surfaces. The high and low level settings in four-wheel-drive mode make it easier to select drive style based on road surface. Ever since the news about Jimny was out, we have been eagerly waiting for its launch. 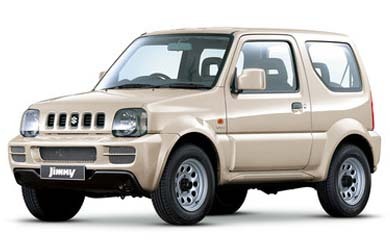 Jimny looks like a compact SUV which stands alone in the present SUV class. Its comparatively smaller size is ideal for maneuvering on the over-crowded roads. Price also seems reasonable. I am sure, given good performance as claimed by the manufacturer, Jimny will be the SUV of tomorrow. Only the three-door system gives an uncomfortable feeling. Hi. Readers.. Maruti Jimny’s Specifications sounds nice, but in my opinion 3 door idea will be Fail like Tata Sierra. Lets See, Time will tell the Difference. i have the same opinion as your. but as i had discussed with my mechanic at workshop, he advised me that if i need the side door they are able to make it for me after modification.. anyways let the vehicle come and will decide only then.. good luck for you also..
i am also waiting to purchase the same..it has one more hidden quality that we will manage the vehicle in delhi’s chaos as of its compact design..
i am really interested in Jimny as i am from the hills so it will be an ideal suv for us but when will it be on the Indian road…. the price range seems to be fine as well. Hi,Readers,Specifications of Maruti Jimny can make a Compact Suv Lover Impatient to wait for it. But after coming,so many options in market like and Compact Suv PremierRio,Mini Xylo,Mahindra Thar. Maruti have to come up with more Comfortableness in every aspect,in Comparision with all these Competitors.But one more aspect which Maruti have to look will be, if Maruti launches Jimny with 3 doors,in my opinion this will be a Fail like Tata Sierra in Past,due to its Non-Practical and Uncomfortable 3 door Concept as per general Indian Choice, Also it should be Diesel Version.Along with Good boot space both for front and rear sitters. And if Maruti makes it under Government Small Vehicle prescribed norms for length,will get Tax Benefit by which it can make Huge Impact on Sells. Lets Wait and Watch. Does any one have an update on the launch date. Have been eagerly waiting for its launch in India. Only 5 door pattern will attract effective response. it would be the best SUV in its class, dream SUV.We have to keep on dreaming because no official announcement yet about its launching date and about its 3doors/5doors versions. only 5 door pattern will be comfortable.how many years we have to wait for jimny? it sounds to be good but it should be 5 seater.